Low C Bass Clarinet Entry Level Great Quality for the Money – NEW! People have been asking me to find a good quality entry-level Bass Clarinet for school band programs, doublers, and basically anyone who wants to play bass clarinet but not spend $12k+ for a Buffet or Selmer. That’s what this is. These are sold under a few other names online, and they get great reviews. See also here. My band director friends who use these in their programs say they’re unbeatable for the price. This should be the best price available. The original Yamaha 675 will always have a special place in my heart, because an alto just like this one was my first fully professional saxophone that I saved up and bought many years ago. The Yamaha Custom line is built to be the best of the best. It does everything pretty well, and it is just effortless to play and to keep in good adjustment over time. This horn is in very good playing condition and feels great under the fingers. Yamahas come with fairly stiff action, and they need the spring tensions adjusted lighter if you intend to play them for very long at a time. This one had that done, and got the pads all tuned up also. It also comes with a brand new upgraded V1 neck. The V1 is easily the most popular Yamaha neck on the market today, and it represents a nice upgrade. It has a focused, projecting, medium tone between bright and dark. It’s what comes with both the new 82Z and the new 875EX-II, so it does both jazz and classical well, and people love it for both. All in all, you’re getting a great, fully professional Yamaha Custom alto built to outlast anyone who may be reading this description. It tunes great, it feels great, and it just plays so easily. The horn gets out of the way so that you can make the music that you want. And the tone itself is beautiful, round, warm, and medium dark. Works great for jazz with a Meyer style piece, or for classical with just about anything you want to use. Getting a used pro alto like this is a smart move. It holds its value and is satisfying to own. Way better decision than buying a new student instrument or a Taiwanese sax that will instantly lose half its value as soon as you buy it! This plays better and holds up much better over time. Top quality. The YSS-475 is made with the tooling from the YSS-62 and plays just like a coveted Yamaha 62 purple logo soprano, but costs less. 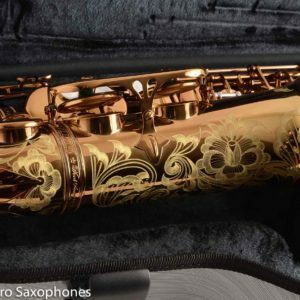 This makes it by far the best entry-priced soprano saxophone. It’s really a professional soprano for an intermediate price. Tunes great, sounds warm and pleasant, keywork is comfortable, and the price is low. What’s not to love? This one has been played only a tiny bit since new, and it looks almost like a new instrument. It includes everything in the photos – nice original case, mouthpiece, and some other accessories. It comes with a fresh checkup to make sure the low-miles pads are sealing their best. These always sell quickly. Get yours before it is gone. I’m a big fan of the Yanagisawa 800 and 900 series horns, and this is a very good example of why. This is a very clean, extremely well built (Yanagisawa has arguably the best craftsmanship among modern horns) truly professional quality tenor in good playing condition for barely more than a new Yamaha student model. The intonation is excellent, the tone is pleasant and full, and the horn itself is built to last. This particular instrument is in very good physical shape, with a few scratches and repaired dings on the bow, but no major (or even medium) physical damage past or present. You can expect this to be a reliable instrument for however long you own it, and it represents an extremely good value that is hard to beat. If you are looking for a full-on professional quality tenor for less than $2500 that is ready to play, you likely know how hard that can be to actually find- but here it is.